On 27 November 1830, Catherine Labouré, a young novice with the Daughters of Charity of St. Vincent de Paul residing in Rue du Bac in Paris, had one of a series of visions. Virgin Mary appeared to her, telling her to have a medal made after the model she showed her, and promised that those who wear it would receive great graces. Production of the medal started in 1832. There were soon reports of conversions and cures happening to people carrying the medal, and it became known as the Miraculous Medal. Within a few decades the medal had been distributed worldwide, in millions of exemplars. Several organizations, the aim of which was to aid distribution of the medal were founded, and some are still active today. The medal is oval, and on the obverse is a representation of Virgin Mary as The Immaculate Conception. She is depicted standing on a globe, treading on a serpent. Rays of light emanate from her outstretched hands. 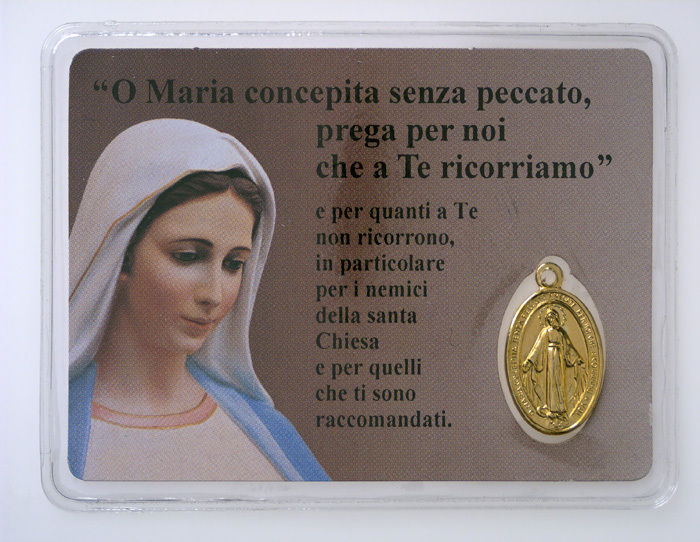 The text around the edge reads: Oh Mary, conceived without sin, pray for us who have recourse to thee. The year 1830 acts as a reminder of the apparition of Mary to Saint Catherine Labouré (she was canonized in 1947). On the obverse is a capital M combined with a cross upon a bar, below which are depicted the sacred hearts of Jesus and Mary. Twelve stars encircle the reverse motif. The medal may be worn in a chain around the neck, attached to a ribbon or a rosary. A much used variant these days is the one showed here; the medal and a card are laminated, and fit easily into a pocket or a wallet. 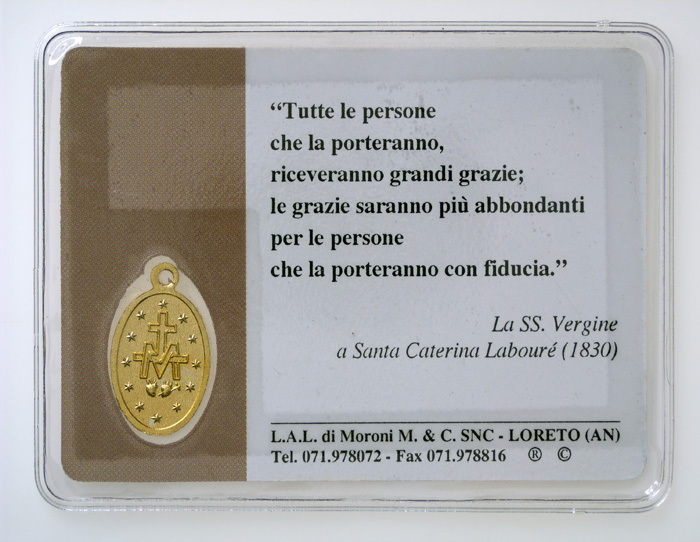 This way of mounting the medal gives opportunities for combining the Miraculous Medal and its message with pictures and prayers relating to other saints, places and cults.